Lots of companies rank “innovation” HIGH on their corporate value list. Yet, when it comes to their own internal brainstorming sessions, they’re still stuck in 1950’s BS … thinking that brainstorming is limited to sitting around a conference room table shouting ideas at some poor facilitator who can’t write fast enough. In reality, there are HUNDREDS of brainstorming tools and techniques. 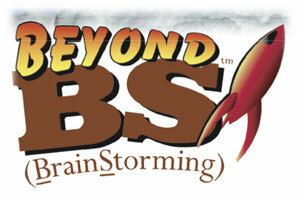 John Storm’s stimulating Beyond BS™ program offers a unique opportunity to learn, practice and apply multiple brainstorming resources to generate powerful ideas and solutions for your company’s High-Stakes Issues and Million Dollar Problems. Discover New Ways To Capture Ideas and Bring Them to Life! How Much Would it be Worth to Equip Your Team With Cutting-Edge Innovation Tools They Can Use EVERY DAY to Generate More Profitable Ideas?